A Connecticut man of Pakistani descent has been taken into custody in connection with the Times Square car bomb case -- at JFK Airport. A U.S. citizen, Faisal Shahzad, 30, was apprehended by Customs and Border Patrol agents at the Queens international airport at 11:45 p.m. at Terminal 4. He was onboard an Emirates airline flight to Dubai, when he and a friend were removed from the flight, law enforcement sources said. The friend has been released. 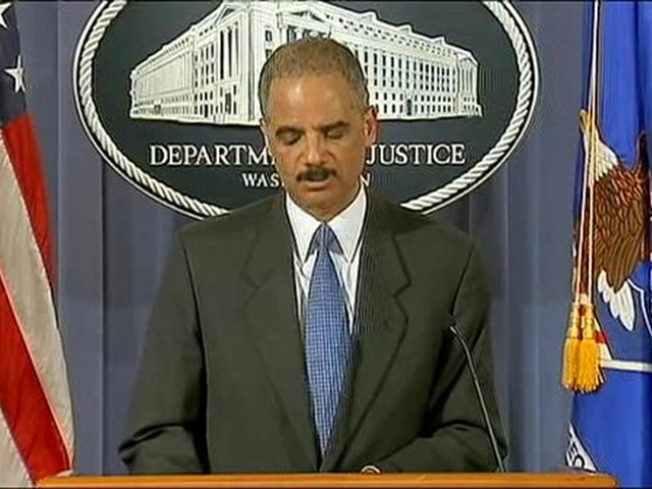 United States Attorney General Eric Holder took the unusual step of holding a news conference at 1:30 a.m. on Tuesday, saying that even though there has been an arrest, investigators from numerous federal and local law-enforcement agencies are still tracking down multiple leads. "We continue to gather leads in this investigation and it is important that the American people remain vigilant," said Holder. "This investigation is ongoing, it is multifaceted and it is aggressive," he added. "We will not rest until we have bought everyone responsible to justice." He noted that "this would have been a deadly attack" and "the intent was to kill Americans." Shahzad is accused of driving an SUV packed with explosive materials into Times Square. Officials said that he will appear in Manhattan federal court later Tuesday at a currently undetermined time to be presented on formal charges. "I want to thank the men and women of the NYPD, the FBI, the US Attorney's Southern District of New York, Customs and Border Protection, and the many other agencies in New York, Washington and Connecticut whose focused and swift efforts led to this arrest after only 48 hours of around-the-clock investigation. I hope their impressive work serves as a lesson to anyone who would do us harm," said Mayor Michael Bloomberg. "The investigation remains very much ongoing, and the dedicated agents, detectives, and prosecutors on this case will continue to follow every lead and use every tool to keep the people of New York City safe. We will not rest until every terrorist, whether homegrown or foreign-based, is neutralized and held to account," said United States Attorney Preet Bharara, FBI Special Agent-in-Charge George Venizelos, and Police Commissioner Raymond Kelly in a joint statement. Late Monday, New York police and FBI agents had narrowed their focus on Shahzad, who recently returned from a trip to Pakistan and three weeks ago bought the 1993 Nissan Pathfinder from a Bridgeport college student the day before the failed car bomb was found on Saturday night. "Now we know this guy was in Pakistan for five months. The question was had he been to training camps by the Al Qaeda or the Pakistan Taliban. If he was he wasn't paying attention in class," Michael Sheehan, a counterterrorism expert, said. Investigators say Shahzad's name was on an email that was sent to the seller of the SUV last month after they connected on Craigslist, but officials cannot definitively say whether he used his own email or whether someone else sent it from his account. And even if Shahzad, who has lived in Shelton and Bridgeport, Connecticut, did use his own account, and is the person who bought the car, investigators don't know whether he is also the man who drove it into Times Square Saturday night. Nonetheless, he is the strongest lead yet. The FBI has checked his records and found repeated contacts overseas, but they cannot say whether those are innocent or somehow related to the bombing attempt. Officials said Shahzad had recently traveled to Pakistan. It was a Vehicle Identification Number in the car's engine that led investigators to the former owner, who was the last person on record to be officially associated with the SUV. This morning, police spoke to that seller of the Nissan Pathfinder, but Chief NYPD spokesman Paul Browne said that person is not a suspect. Police have not yet identified who the driver was and Browne said they are still looking for suspects. The New York Post reported that the seller was a female 19-year-old student whose mom said she was nervous about "the guy coming after her." Quantico, VA for forensic analysis, Kelly said. Investigators had feared that a final component placed in the cargo area - a metal rifle cabinet packed a fertilizer-like substance and rigged with wires and more fireworks - could have made the device even more devastating. Test results late Sunday showed it was indeed fertilizer, but NYPD bomb experts believe it was not a type volatile enough to explode like the ammonium nitrate grade fertilizer used in previous terror attacks, said police spokesman Paul Browne.